Hi guys, guess what today is??? April Fools Day! Well it is but this is no joke. We are excited to bring you the APRIL release, beginning with our LIMITED EDITION "Wonderland Beans" as well as our Delicate Words which will be available ongoing in the TGF STORE. We also have some big news as far as releases go. As you may have read, TGF is thrilled to announce that starting NOW we are going back to MONTHLY releases (woot woot)...so there will be a lot of additional excitement here on the Farm! I embossed the card base and the vellum doily with a floral & dotted embossing folder. I kept everything white except for the ribbon and the image. She is colored with Copic markers. I love love her hat. I Stickled the crap out of it and some on her dress as well...hehehe. To add some dimension, glossy accents were used on the flowers and the hearts. Ok, who wouldn't want to get their grubby little hands on her and the ENTIRE collection?! Thanks so much for visiting...and we hope you enjoy APRIL in Wonderland! I wanted to post this card before Sunday. I used Blush Beatrice from The Greeting Farm. Dressed up in her best Easter outfit, she is both paper pieced and colored with Copic markers. I created a floral spray using I Am Roses flowers. I used a part of a ready made spray, added a maple leaf, a rose pink colored flower and some foam head stamens. I used some pink/green paper scraps for the card. Spun Sugar Distress Ink was the perfect match for the soft pink I was going for. So there is my card. I hope that you all have a beautiful Easter Weekend! Thanks for stopping by. Come back April 1st. 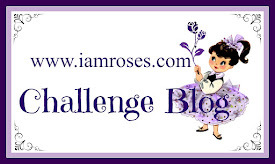 There's a TGF Blog Hop AND a new I Am Roses Challenge coming. 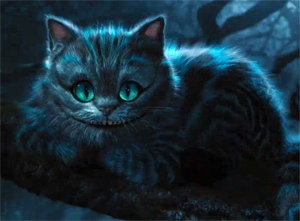 TGF - April Preview "Cheshire Bean"
Good Morning! I am so excited to share with you one of the New TGF April Releases (Available April 1st). Here she is, Cheshire Bean. 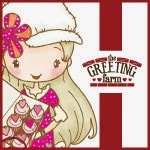 Head on over to The Greeting Farm Blog to enter to win this new Limited Edition stamp. There will also be a Blog Hop on April 1st showcasing all the new releases and a chance for you to win the whole set! I am on a daisy flower kick and I had to use them again in this card. There were daisies on the DP so I HAD to and I also paired them up with some tiny pink roses. The image is colored with my Copic markers and I incorporated some leaf branches and vellum onto the card. To add some glitter, I used Stickles in Fruit Punch to her ears and dress. If you look closely, you can see the sparkle in her eyes are stars! Adorable! She is Cheshire Bean obviously it's a Alice in Wonderland theme, so I pulled this image from the internet as inspiration for my next card. This is what I came up with. Totally a complete opposite from my previous card, it's like Day & Night. The background is a mixture of blue/turquoise/black acrylic paint that I laid on the card with my Gelli Plate (video of my first try with this gadget here). I then sprayed the background with my Lindy's Stamp Gang sprays in Midnight Rendezvous Raven and Royal Peacock Fire for some sparkly shimmer. The stamped some forest-like images in black and outlined it with my white gel pen. I doodled some stars in the sky. I really like how this turned out. Cheshire Bean is colored with my Copic markers. So there are my cards using Cheshire Bean. These are going to sell out fast, I just know it! This whole new release is so freakin' amazing! Don't forget to go to the TGF blog to enter to win her. Hello Friday, it's about time! LOL. It's Farm Fresh Friday over at The Greeting Farm Blog. 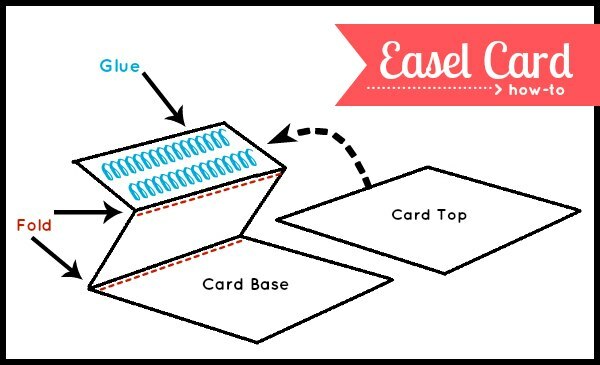 Today I'm hosting and the challenge is to create an easel card. Pretty easy huh? The image I used is Anya Blooms. The sentiment inside the card is also from the stamp set. I love pairing her up with my I Am Roses Daisies, they make a perfect pair together. I embellished the card with lace and pearls. The paper collection I used is K&Company Julianne. Please give this card a try and enter it for this challenge over at the TGF Blog. Thanks for stopping by and have a beautiful weekend! GOOD LUCK! Hello everyone! 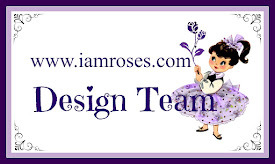 Welcome to the I Am Roses "Spring has Sprung" Blog Hop. For more details on how to win, visit the I Am Roses Challenge Blog. If you are going in order you should be coming from DT Member Ivett's Blog. I made these cute mini Easter treat baskets. The DT challenge theme was Easter and we had to use Leaves & the color Green. So I ended up using GREEN LEAVES. These little treat baskets were very inexpensive to make. They are actually paper cups from the dollar bin at my local Target store. I used the green leaves to trim the top of the cup and added a strip of cardstock for the handle to make the basket. I made a quick mini tutorial on how I assembled these treat baskets here. Next DT Member up is Joy Nieva. Don't forget to leave a comment on my blog and GOOD LUCK!!! Hi guys! I had so much fun making this card for the Double-Take Tuesday Challenge over at The Greeting Farm Blog. I used the new Digi Good Luck Anya. Isn't she adorable with ther top hat. This was my first attempt to make a rainbow using my Copic markers. I used the broad tip end, YES there's another end to the marker LOL. I picked out the colors that I wanted to use, butted the marker up against a ruler to make it straight, then just ran the marker down the ruler to apply the color. It came out pretty darn cool. Oh I forgot to mention the challenge for this DTT was to incorporate flowers. I picked matching rainbow colors for the flowers and placed them around the sentiment "Smile Everyday" from the set Mini Fleurs w/Die. The image is colored with my Copic markers and I added a pop of sparkle with my Stickles in Crystal. Hope you guys take the time to play along with us in this challenge. GOOD LUCK!!! Have a happy Tuesday! Sparkle & Shine is this theme for the Farm Fresh Friday's Challenge over at The Greeting Farm Blog. This is for all you glitter and bling addicts. I used the new Blush Crown set. I stamped the large crown image with black Versafine ink, applied glue on the inside of the image and sprinkled black glitter on top. This card is pretty simple, I just love the pattern paper in the background. I didn't want to add another pattern to the card, so I used vellum for the fish tail banner. For my bling, I place black rhinestones on top of the vellum. On the inside of the card, I stamped the smaller crown image at the corner. No Copic markers used for this card, surprising huh? It can be done! Thanks for stopping by and have a fab weekend! Oh Boy Oh Boy! It's time to bust out your old TGF stamps. This theme at the Retro-Fresh Challenge over at The Greeting Farm Blog is boys/masculine. I decided to use Cafe Ian. 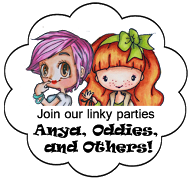 I had this really cute transparency from Hambly of mustaches. LOVE! To make Ian match, I drew a mustache on his coffee mug LOL. Not bad for my free hand skills. He's colored with my Copic markers, as usual. I have a video of my coloring him here. I'm sure you guys have a Ian in your TGF stash, use it and play along with us. Good luck! Have a great Wednesday! Today's Double-Take Tuesday over at The Greeting Farm Blog is a photo inspiration challenge. How beautiful is this decor. 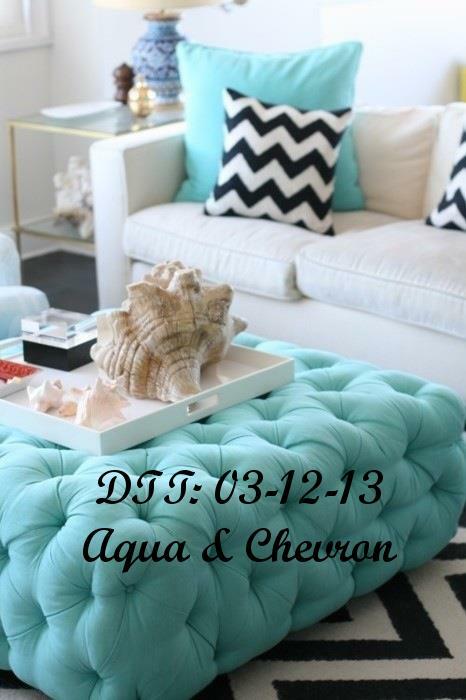 Chevron is so in right now. I had fun incorporating it on my card. I love the color combo also. This cutie is CC Monday Morning. I loved giving her smokey eyes hehehe. I glittered up her hair clip and her skull. Her sweater dress is paper pieced with some polka dot dp. I have a Copic coloring video of her here. Hope you guys play along with this challenge. Have a happy Tuesday! It's Friday, it's Friday!! Any plans for this weekend? Me, I'm catching up on sleep and probably crafting. Ok back to my project. It's another Farm Fresh Friday Challenge over at the TGF Blog. 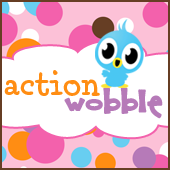 Check it out and play! The theme is St. Patrick's Day "Lucky You". 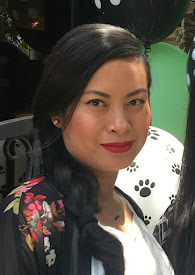 I used the new March release Blush Beatrice. For the life of me I had no St. Patrick's Day themed paper. Luckily I had a glitter sheet of four leaf clovers, pheww! I stuck it on her bow, perfect! I rummaged through my green papers and I also had green Copic markers. To be more festive, I colored her hair green, love it! I had this beautiful laser cut frame in my stash and decided to use it on this card. The flowers are from I Am Roses and I finished it off with a black satin ribbon and some lace trim. She kinda reminds me of an anime (Japanese cartoon) character with the green hair. Do you guys remember the cartoon Robotech?? LOL I loved that cartoon. Have a fabulous weekend everyone!! Ba-Bye! Hello. This is my card for today. Can you guess which two Creeper Crew stamps I used??? LOL If you guessed CC Abbey & CC Monday Morning you're right! I love the slouchy sweater and the leggings. I glittered up both bows on the image. So cute! Anyways, so I just used a black card base and my white gel pen to draw my heart doodles. I drew a word bubble around the sentiment, cut it out and then used pop dots to adhere it to the card. I drew some lines on the border of the card and it kinda smudged a bit but I thought it actually looked intentional. So there's my card. Get more out of your stamps and do a body swap! It's fun and addicting. Thanks for stopping by and come back tomorrow for a new Farm Fresh Friday challenge. It's Tuesday and this March we have new stamps to play with. If you haven't seen the new March Release, check it out over at The Greeting Farm. This DTT's challenge is Blue & Brown and I am using the new Anya Blooms stamp set. She is wearing the cutest dress and boots. I colored her with my Copic markers and I recreated her daisies with my I Am Roses Daisy flower that I sprayed with Lindy's Stamp Gang Bachelor Button Blue Starburst Spray. I think it is a perfect match. I added some Yellow Stickles to the center of the flowers and also on the paper flower. This stamp set comes with two sentiments. She's also quite a big stamp measuring about 4.5". Whoa nelly! 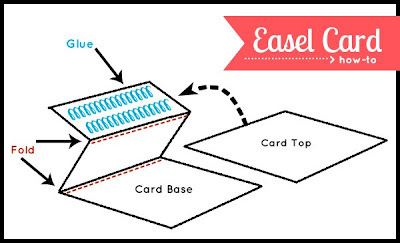 So my card base measures 5.5" x 5.5". She would also fit on a regular A2 size card. As always I hope that you guys give this challenge a try and enter for a chance to win a TGF image. Come and play with us! Thanks for stopping by and I have a great week!